Mastering the `out of system’ play in any match is absolutely critical to success. This video features a fast-paced and high energy practice with drills that focus on having all players work on setting out of system balls. The ball does not always go to the setter and therefore others need to know what to do in those situations and still attack the other team. The drills will help improve players ball control while giving them an understanding of running an out of system offense. There is also an added focus on being able to serve and hit balls down specific traffic lanes from multiple positions to keep the opponent out of system. Getting your opponent out-of-system on their first contact will give your team a huge advantage. Identifying specific lanes to attack with your serve can disorganize and frustrate an opponent, leading to easier transition plays for you. All of the drills are fast paced with little down time in between reps. Teams play how they practice. Stressing pace and tempo of every drill will help ingrain that philosophy into your team. The game-like drills carry an intensity that matches the actual game and the players are challenged. The first practice focused on how to run an offense with bad passing, this practice is geared towards how to run it with great passing. This video is all about offensive connectivity, which sounds like it might be all about attacking but it’s much more than that. 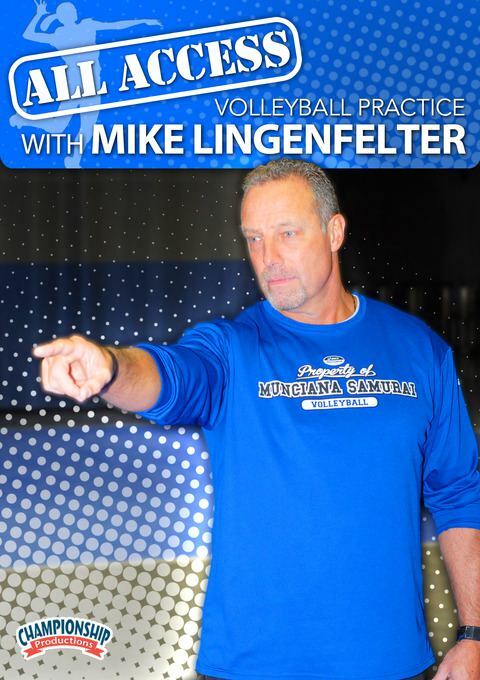 Coach Lingenfelter uses passing and serve receive drills to stress the role and importance of a good pass. The focus is on movement and platform control to ensure successful first ball contacts. He includes a runs a 6v6 drill where the team receiving serve is at a deficit to stress the urgency of scoring off of serve receive. After that he uses a variety of attacking drills to work on a fast offense and communication. You’ll see multiple offensive attacks off of hitter coverage for fast-paced retaliation. The drills shown give players countless reps of running different play sets at game speed or even a little faster. All the drills all have some kind of competitive edge to them that holds athletes accountable for their play. The main focus in this practice is on how to play defense, transition to offense from defense, and also blocking. The emphasis is on speed in “resetting” by transitioning faster than your opponent. Footwork, speed and relentless pursuit of the ball are at the forefront of the fast-paced, game-like drills presented to reinforce the skills necessary to properly transition from defense to fast attack. You’ll see simple cues for communication on serve received, based on trajectory, velocity, and location, especially in seams. Coach Lingenfelter demonstrates drills that train ball control, defensive position, defensive posture, digging and blocking. He does a great job showing viewers how to train speed from a dig to an attack on the defensive side of the ball. He runs a six-person drill to simulate a quick read of the opponent’s setter to establish a fast blocking and defensive reaction that prepares them for a quick retaliation in transition. Get the most out of your training time. You can maximize your practice by seeing the speed of these practices and the amount of touches the players get on the ball. 362 minutes (3 DVDs). 2015. All Access videos are designed to allow viewers from all over the world to see how successful coaches run their practices in a “live” practice setting. All Access videos allow viewers to see the practices un-edited and in real-time. You will see how top coaches run their drills, interact with their team and staff, how they motivate their team, the cue words they use, the atmosphere of the practice and how practices are structured from day to day. Many coaches visit successful colleges and high schools to watch practice. But if you live out of state or out of the country, visiting another coach’s gym can be costly. That’s why we created the All Access Practice Series of videos — to bring the practices to you!